Update: We have a coupon that makes this LOWER than last time! We found a nice deal on Bai Antioxidant Drinks for you on Amazon! Hurry and get the Bai Coconut Flavored Water, Molokai Coconut, Antioxidant Infused Drinks, 18 Fluid Ounce Bottles, 6 count today for as low as $5.99 ($1 each) from Amazon when you clip the 25% off coupon & choose Subscribe & Save with at least 5 subscriptions in one month. These are $2 or more at the stores! Check out all of the Amazon deals here! Want it sooner? Choose one-time purchase, clip the coupon & pay $7.49. Amazon Prime members get FREE 2-day shipping!! If you are not a Prime member, get FREE shipping when you purchase $25 or more of eligible items across any product category. 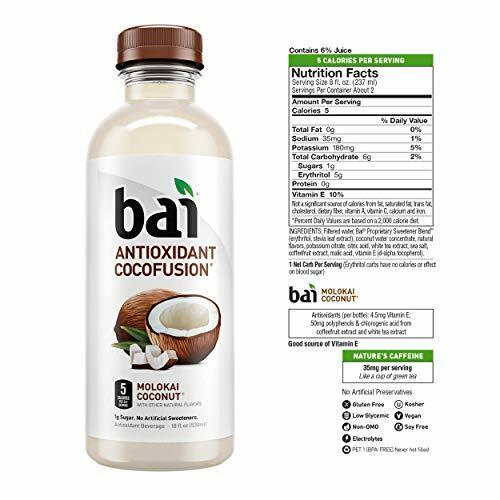 Bai Cocofusions Molokai Coconut Antioxidant Infused Beverages offer a full kick of flavor and hydration without the excess sugar and calories. Delectable coconut-flavored water delivers a taste of sunshine in every sip, with only 5 calories and 1 gram of sugar per serving. Bai Cocofusions Molokai Coconut is free of artificial sweeteners and is infused with antioxidants for delicious refreshment you can feel good about drinking. Buy the Bai Coconut Flavored Water, Molokai Coconut, Antioxidant Infused Drinks, 18 Fluid Ounce Bottles, 6 count from Amazon. Previous articleBounty Quick-Size Paper Towels (16 Family Rolls = 40 Reg. Rolls) DEAL!